One of my pet peeves about both the network and cable news channels, which I'm sure is a pet peeve of many concerned people, is the lack of real news on any of these shows. What passes for the news in the United States is pitiful. When returning from other countries I am always struck by the fact that our news stations are so limited in their scope and play up so many trivial things while people die and wars go on elsewhere. Since I found the picture using Google Images on the internet, I was getting concerned that it might be a copyrighted image. So I decided to be bold and put a real picture of me on the beach in Maui instead. So as of today, this is the new - and real - me! Note that I am suitably attired in a bathing suit but hiding behind the tree branch to avoid too much exposure in the picture! Did you ever have a week that just flew by and yet at the same time seemed to last forever? That was this week. Between work (way too many meetings plus some actual stuff that had to get done in between) and after-work activities, I have had very little time to do anything else. But finally it is Friday and after a morning full of meetings, two of us went out to lunch with a former employee and took a long lunch at, appropriately, TGI Friday's. It was the first time in weeks that I hadn't eaten at my desk. When I arrived home, Diva greeted me as usual with her waggy tail and then proceeded to bark demandingly (her favorite tone of voice) until I gave her a biscuit. We have discovered these new biscuits at our local pet food store that she absolutely adores. I don't know what is in them but she goes nuts for them: Holistix. We feed her food by the same company and it's the best food we've found for her. She likes it and it really agrees with her better than other foods. But these biscuits were a whole new dimension of dog biscuit for her when we brought them home the first time. She actually could not sleep the first night they were in the house. She got off the bed and ran downstairs to the kitchen and was running all over sniffing the air trying to figure out where I had left them. I had to finally take them out of the kitchen and move them to a cupboard in the pantry so she'd stop thinking about them. She must be able to smell them all the way upstairs. Talk about your favorite snack calling to you! Tonight DH and I went out with our friends to unwind, to a local bar that has been in the same place forever and is known for their excellent cheeseburgers. So we had a totally decadent meal of wonderful medium-rare cheeseburgers, fries and onion rings fried in grease that had been in use "since the Hoover Administration" as DH said; but weren't greasy, just tasty. Sometimes I just have to have a meal like that, even though afterward the guilt sets in and I start wondering whether I should get some Lipitor and keep it on hand like an antidote to take afterwards! Two posts in one night, a new record. Was checking out Blowing in the Wind (see link in the 50s Blogroll) and came across a neat quiz on her blog. Check it out. I found out I don't eat as healthy as I think I do! Your diet is healthier than the average American diet - but that's not saying much! You already know what's good for you. Just eat more of it. It's such a universal truth, the way, every day, we get up and go through our usual routines. I read that line and knew exactly what he was talking about. Every day I pour myself a cup of coffee and use a spoon to stir the cream and sugar into it and lay the spoon down on the counter (dribbling a little coffee there, which will later dry into a hard scum that is hard to get off). And so our lives go by, one little detail at a time. And now that I take various medications every morning (since I am officially middle- aged, with high blood pressure), I paraphrase in my mind, "My life is measured out with hydrochlorothiazide pills" and the line also crosses my mind as I open up new disposable contact lenses each day...."My life is measured out with contact lenses." It all works. Eliot's quote was pure genius. Death beating the door in. Carved beads and a lotus pod. . . .
Death beating the door in." Another universal truth - we all spend so much time working, buying things, gaining possessions, and all the while we are all headed to the same fate. Do you ever get sick of your own face? Like, you know how at the end of the winter, you're really, really sick of every sweater you own and sick of all your winter pants and sick of wearing shoes and socks and can't wait for spring clothes to be appropriate to wear again? Well, that's how I feel about my face. Every morning, I look in the mirror, and there it is. The same face. I don't get to change my face when the weather changes. It's still there. Same old circles under the eyes that have to be covered with concealer, same old eyebrows that have to have a touch of eyebrow pencil or you can't see them. Same old two lines across my forehead. Same old face. I think I'm beginning to understand why people have plastic surgery. It's not all about looking younger. It's about being sick of their face. It's like when you look around your living room and think "Gee, I wonder what the couch would look like over THERE instead of HERE? I'm tired of this arrangement!" So the next thing you know you have your husband patiently moving furniture around the room and gradually getting grouchier with every new instruction. However, I'm not a plastic surgery kind of person. So I guess I'll have to be content with at least having new hair. Yes, in a way I have new hair. I stopped dyeing it last fall and it has finally grown out. It has a streak of grey in the front and some salt-and-pepper action going on all over. It has added one new bit of interest to the sight in the mirror. I'm not sure if it's good or bad but at least it's new to me! I suppose if I lost 25 pounds that would make some changes too! 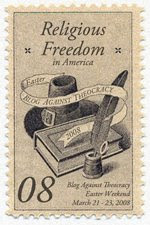 My cyber-friend Ruth, who has several blogs, including Me, My Life, My Garden (with wonderful pictures of her English garden), and There Are a Million Stories in the Naked City (which talks about her daily experiences caring for her husband Mick), picked my blog "out of the hat" as one of her "Thinking Blogger Awardees." Many thanks, Ruth! I would return the favor but I know you were already awarded the Thinking Blog Award by the gals at Women on the Verge, who author the blog Did we say that out loud? 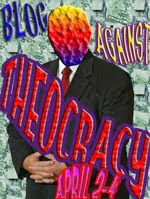 Now it is my job to pick five blogs that "make me think." 1. Lawyerish - I always enjoy reading Lawyerish's posts; she is a faithful poster who lives in New York City and, obviously, is a lawyer. Her posts range from daily experiences to her tales of the bureaucracy surrounding adoption, and commentary on various subjects of interest. 2. 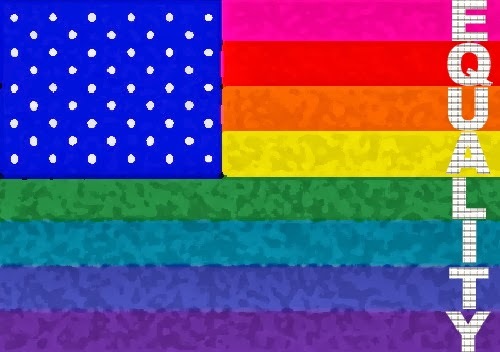 Wonderland - Weekly commentary on current events (both serious and humorous) by the wonderful Alice Bradley, whose personal blog, finslippy, is also a favorite of mine. 3. Crazy Aunt Purl - While she sometimes focuses on her experiences with her stitching/knitting group (hence the name Purl) she also covers many other topics and experiences, both serious and humorous, and includes a lot of great pictures, including those of her very photogenic cats. 4. Jonniker - another very prolific poster who ranges over a variety of topics, always interesting, sometimes hysterically funny. 5. Time and a Word - Gorgeous photographs of Lisbon often coupled with commentary about the state of the world. So, congratulations to the Thinking Bloggers! Actually all of the blogs I read are written by wonderful, "thinking bloggers." This blogging universe is so fascinating - the way people are able to get their ideas out into the world and people from all over read them. It lets anyone be a writer if they want to be and know that their ideas are getting out there. It's truly a wonderful cyberworld! Diva is home again from her latest ordeal. She had on one of those narcotics patches for pain, and was acting as if she was an old drunk, staggering about. I think it also put her on a crying jag, as she was whining pitifully, and every whimper ripped my heart out. She had no appetite for dinner, either, and didn't seem to be comfortable. I finally called the vet and asked if it would be OK to take off the narcotic patch. They said I could, and after it was off and some of the effects had dissipated, she soon was able to settle down into a peaceful sleep. She is on another type of painkiller, a type of pill similar to aspirin, so I'm sure that will help any residual pain she does have. In order to keep my mind off Diva's troubles I have posted a new post on Medicana. If you're interested in reading about diphtheria, which once was one of the dreaded childhood illnesses of the previous century, check it out. After Diva had her little bump taken off right before I went to Australia and it turned out to be a mast cell tumor, we were really relieved to know it had been taken off so early and was a low grade type, meaning it was not aggressive. And, we found a little thing on her tummy too. So it was off to the vet again on Friday. Our regular vet said both bumps had to be taken off, so we made arrangements for the same surgeon to do the surgery as before. So today Diva had two more chunks of her skin taken off and is doing fine, but is spending the night at the vet's. Now comes the waiting to find out what the biopsies show. Since the place she has the surgeries done, The Animal Emergency and Referral Associates, also has an excellent oncologist on staff, we made an appointment with her for a week from Monday to consult with her and find out whether she recommends further treatment to prevent a recurrence. We aren't taking any chances with our girl. Of course, Baxter is thrilled with the situation. He loves it when the Evil Dog is not here to annoy him. He is happily curled up on the bed in between DH and me, in the spot usually occupied by Diva, purring loudly. On yet another subject, spring has finally returned to New Jersey. Today much of the snow on the lawn of the Big Corporation melted and the robins must be ecstatically happy, much more than the other day when I saw about 30 of them huddling together on one lone strip of grass surrounded by snow, trying to find worms. Tonight DH and I spent the evening at my mother's eating Indian food. My mother has always enjoyed a good curry, and we often take her out to a local Indian restaurant for Indian cuisine. But recently, wonder of wonders, a new Whole Foods opened in West Orange that actually has a whole section of hot, ready to take out, Indian food (as well as Italian and other ethnic specialities). For those unfamiliar with it, Whole Foods is an all-natural, organic grocery store that caters to gourmets and those with deep pockets. It used to be a lot more true to its "crunchy granola" roots but more recently has expanded into being a top notch gourmet grocery store as well as providing politically correct, grass-fed, organically grown, recyclable packaged produce and other viandes to the local purists. This new store is truly over the top - it has a gourmet organic chocolatier, the aforementioned hot food area, and tonight I even saw they have added politically correct clothing! Organically grown cotton pajamas of some kind; flannel shirts made from hemp and costing $64. But I digress. I must tell you about my frugality. I'm so proud. I actually returned something because I thought it was too expensive. Let me explain. I was wending my way up and down the aisles, as is my wont in Whole Foods (looking at stuff is part of the experience). As I went down the juice aisle, I happened upon a section that included juices - all kinds of exotic types. I spied a bottle of Mangosteen juice and was intrigued. I'd read about mangosteens in the NY Times in this article, and had read elsewhere how healthy they are supposed to be, high in antioxidants and all that. So I grabbed the bottle and stuck it in my cart. After paying for the bounty I had loaded up on, I thought the bill seemed a little high so I glanced at the receipt - and lo and behold, my mangosteen juice was $18.99. $18.99!!! For a small bottle of juice! And it was juice I hadn't even ever tried before. What if I hated it? Now, I tend to be extravagant, even profligate. But even for me, $18.99 was crossing the line. Maybe it was thinking about that $2000 bill for Diva that was going to be on my credit card this month that did it. I marched over to the Courtesy Desk and asked them to take it back and refund the amount to my credit card. As I walked away I heard the girl at the Courtesy Desk say to her associate, "Guess how much this juice is?" "I don't know, $10.99?" "No, $18.99!" "You're kidding!" If even the Whole Foods employees are shocked by the price, it must be bad! Blogging, like everything else, requires skills. You start out with the basics, and then you learn little tricks. For instance, links. Up until now I have been too lazy and dorky to figure out how to do something I've noticed all other bloggers seem to know how to do: Post a link without showing the URL of the link. Since today is Saturday and I had some time to kill, I finally went to the trouble to figure it out by going to Blogger Help. Hopefully this will show the name of the blog but not the URL. The reason I like this blog is it's about a woman from New Mexico who has moved to Maui (duh) and she writes about what it's like to live on the Valley Isle. She is in synch with my liberal political views and sounds like a fun person. And I love reading about her descriptions of her days on Maui since I often know exactly where she's talking about. She lives in Kihei, which is the town in Maui where we've stayed the most. I'm going to post this now and see if my link worked! But I'm not trying to quit. I just started another new blog - a travel blog. The one I always meant to start, Marvelous Meanderings. Except it was going to be a travel newsletter. 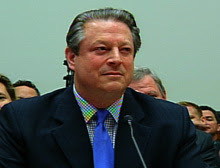 DH and I had talked about doing this back in the late 80's before the Internet had been invented by Al Gore. Of course now hard-copy newsletters are so 20th century...so what else could I do but start blogging one instead? 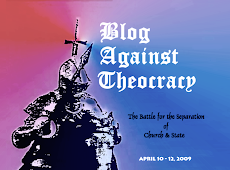 This blog will be fun since DH will be participating as well. I'll be doing the actual blogging (since I type 90 words a minute and he is, ummm, typing challenged, shall I say?) But he will be helping with the writing. We had often talked about what we'd put in our newsletter and we even had a motto all picked out..."Ask one of us, we've been there." We thought it would make a good travel agency motto too, except those too have pretty much gone the way of the snail mail newsletter in this age of on line bookings. The first entry, not surprisingly given our recent trip there, will be on Adelaide, South Australia, but so far I just have the introductory post up. Check it out now and then check back in a few days for the first real post! http://www.mauigirlsmarvelousmeanderings.blogspot.com. I find it hard to believe that it was really necessary for us to have a 6-12 inch snowstorm on the Ides of March. But apparently that is exactly what is planned for us. Vague prognostications about rain that "might be mixed with snow" toward the latter part of Friday started being mentioned in the weather forecast a couple of days ago. These vaguely unsettling comments gradually morphed, much like the transformation of Lon Chaney into the Werewolf, into a full-fledged Winter Storm Warning, complete with dire predictions of large accumulations of snow and sleet, always "higher in the northern and western suburbs." In this case apparently we count as one of the "western suburbs" and will likely get a good amount of the white stuff. The sad thing is, we had two wonderful days of summerlike weather on Wednesday and Thursday. Heck, Wednesday it hit 80 degrees. I walked out of work into the parking lot with no coat on, and reveled in the warmth. The poet said April is the cruelest month but I think it should be March. Today the robins returned to the lawn of the Big Corporation. This is a yearly tradition, much as the swallows return to Capistrano or the buzzards to Hinckley, Ohio. Every year during the first two weeks of March, a huge flock of robins shows up on our parklike campus. They hop all over the lawn, they perch in the trees. Then after a day or so of stocking up on worms, they seem to disperse throughout the area and only a few remain. This is the second time in the past few years that they arrived mere hours before a heavy snowfall. I hope they survive; worm eating birds are hard pressed to find worms through 8 inches of snow. On a brighter note, I promised more details about our celebrations of St. Patrick's Day. We have a full weekend planned. Friday night is our night out to celebrate in the appropriate fashion - going to see our favorite band, Paddy and the Paleboys (mentioned previously) at the Harp & Bard in Clifton, NJ. Conveniently, I was able to find a picture of them at the Harp & Bard, so I'd like to introduce you to them all. On the left is Mike, the drummer is Bobby, Marty is the guitarist at right by the mike, and on the far right is Steve with the mandolin. Steve is amazing, he plays more instruments than I can even remember, plus he composes music. His main instrument is the fiddle; but he plays the "squeezebox," the mandolin, the tin whistle, the harmonica...and probably more that I'm not thinking of. I suppose you could say our group of friends are...well...groupies of this band. We try to go to any of their performances that are not far from our location (I didn't say we were totally dedicated groupies...it's not like we're Deadheads or something). 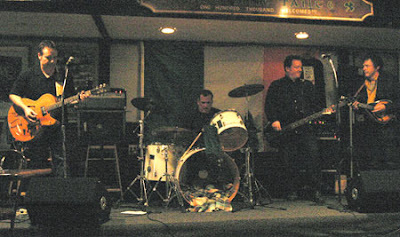 But we do try to go see them whenever we can, at the Harp or at the Shillelagh Club, which are in adjacent towns to us. I don't know whether a group of middle-aged Baby Boomers counts as groupies but it works for us, and for the band. Saturday, on The Day Itself, we try to stay out of the bars (as someone recently commented, St. Patrick's Day and New Year's Eve are for the amateurs). So instead we are having a group of possibly 11 to our house for corned beef and cabbage. It will be a group effort; one friend bringing and cooking the corned beef and cabbage, we're doing appetizers and dessert, someone else is bringing sodabread, another is bringing the Jamieson's and the whipped cream for Irish coffee, and we will also be providing the Guinness and the Irish music. St. Patrick's Day, for some reason, has always been a favorite holiday of mine. Even when I was in high school, I remember my best friend and I took off one St. Patrick's Day and did various celebratory things such as drawing shamrocks in green chalk on the street. (We were only 14, and immature for our age; I realize this was not all that exciting). Then in college I had a really good friend who was Irish - from South Boston no less. She got me into the Clancy Brothers and Tommy Makem and we used to go see an Irish band at the bar down the street from us called The Farquahr. (That may not be spelled correctly). They not only sang Irish songs but also sang funny parodies of Irish songs. This was the beginning of my love of Irish folk music. I should add, I do not have a single drop of Irish blood. The closest Celtic heritage I have is a drop of Wallace blood back there somewhere that at least accounts for my love of things Scottish. The Irish thing I've simply adopted. Plus DH is half Irish, so that counts for something! The reasons I can truly say St. Patrick's Day is my favorite holiday are several: One, you don't have to buy anyone presents. Two, you don't even have to see your family (unless you want to). Three, it's an excuse to drink Guinness and Irish Coffee and see your friends and have a good time listening to Irish music and singing drunkenly along. You're not even required to cook (although you can!). So what can be better than that for a holiday? T'is a Fine Day for the Irish! Yes, I know St. Patrick's Day isn't actually until next weekend. 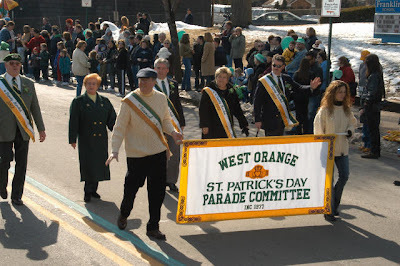 But for us, the celebration starts the weekend before, when the West Orange St. Patrick's Day Parade is held. DH and I went with our friend Angela and her daughter, along with Diva, to enjoy the parade, as is the tradition. Usually we're a larger group but this year some of our crowd were busy doing other things. DH forgot to bring his camera so I nicked this picture off the web, and it actually depicts a parade from a couple of years ago. Thankfully, no snow today - and lots of sun and warm-ish weather. Diva behaved admirably. She lay down peacefully on a blanket and watched as the parade passed by. No crying, no barking (except occasionally at another dog going by). The bagpipes left her impervious and she even took a nap for a short time! After a few Irish coffees in our kitchen, we are off now to the Shillelagh Club to enjoy our favorite Irish band, Paddy and the Pale Boys (http://www.thepaleboys.com). 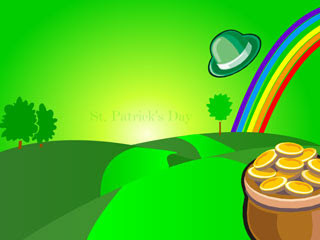 More on St. Patrick's Day as the week unfolds! Check out the new links! If you've been reading my meanderings for awhile you know I am an advocate for the American Pitbull Terrier and all of the other unfairly maligned "bully" breeds such as Staffordshire Terriers, Bull Terriers, and others. Our dog Diva is a great ambassador for her breed, as she loves all people. So, I decided I would put links to rescue groups that specialize in Pit Bulls and other "Bully" breeds on my blog. In case anyone finds the blog by searching on Pit Bull Terrier, these links will help them find more information about the breed. I tried to pick organizations that are large enough to remain in business on an ongoing basis and also try to educate the public about pit bulls and their relatives. Please look at the very bottom of the blog for the new links. I wanted to keep them separate from the links to other blogs on the side of my page. (Update: They are now on the side, below the other links). 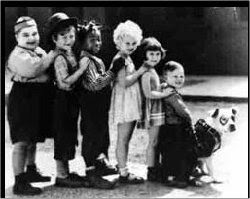 Please click on some of the links and see what you can learn about what used to be considered America's favorite dog; Petey on the Little Rascals shows was a pit bull terrier; and if you're familiar with those shows, you know that Petey got along great with kids! New website to generate fake diseases? Genius! Yahoo News reports that someone has invented a website that generates new diseases that sound real, but aren't. As a hypochondriac, I can truly appreciate the genius of this website! Tucson, Ariz. (PRWeb) March 6, 2007 -- An online tool published today allows users to instantly generate fictitious disease names and descriptions based on terminology commonly used in describing psychiatric or behavioral disorders. The "Disease Mongering Engine" is available at http://www.newstarget.com/Disease-Mongering-Engine.asp and randomly generates diseases, disorders and syndromes that sound real, but aren't. The engine, created by author and natural health guru Mike Adams, is intended as a parody of conventional medicine and the over-diagnosis of Americans with fictitious diseases. "Drug companies actually invent fictitious diseases, then profit by selling drugs to treat those fictitious conditions," Adams explained. By using an online software engine to generate disease names and descriptions that seem real, Adams hopes to demonstrate that just because a disease name sounds real doesn't mean it is. The Disease Mongering Engine can generate more than 73,000 unique disorders, syndromes and dysfunctions. Each one is accompanied by unique description, along with universal instructions for "getting filthy rich" by marketing the fictitious disease and selling FDA-approved pharmaceuticals to treat it. About the source: NewsTarget.com (http://www.NewsTarget.com) is one of the most popular independent natural health news sources on the web. It features more than 21,000 free articles, downloadable reports, interviews, product reviews, videos and cartoons on topics that impact the health and happiness of consumers around the world. I let him read my blog and he said "What's with this DH? Who's DH?" I said, "DH is you, Honey." He said, "What am I, the Designated Hitter?!" I had to explain it meant "Dear Husband." He was only somewhat mollified. So I asked him if he wanted a different name. He said why not just call him "Big ____" (fill in real name of husband here). I said because then he wouldn't be anonymous. I assume he wants to be anonymous. Since he has not come up with a better anonymous name, he will continue to be DH. If anyone has any other suggestions, they will be welcome! In the hills outside of Adelaide is a wildlife park called Cleland Wildlife Park. Nearly 20 years ago, the first time we were in Adelaide, our friend who lives there had taken us there as part of the grand tour of the town that she gave us. We thought after 20 years it was time to go back. The park is a very peaceful place, and walking around the park itself is a pleasure, as the animals aren't in cages at all but in their native habitats. There are woodsy areas, open fields and marshes and ponds. The kangaroos are so tame they will eat out of your hand. The females are usually more active, wandering around grazing on the brownish grass, often with a "joey" in their pouches. Unlike the stereotypical image of Mama Kangaroo with the head of the little one sticking out of the pouch, in reality a more common picture is the Mama Kangaroo with the feet of the joey sticking out. This is because the little one is busy suckling inside the pouch, head first. Sometimes you will see a Mama with more than one joey - the bigger one trying to poke his or her head in while the little one is still inside. Interestingly, I saw on a nature program that in times of drought, the kangaroo mother is able to put a developing embryo in her pouch "on hold" at a certain stage of development until the weather conditions are more conducive to survival. Here is an article explaining a bit more about how the kangaroos cope with adverse conditions. The males are bigger than the females and tend to lounge around. They have bigger upper arms and are bigger all over than their ladies. There is something almost human in the way the males lie around on their sides on one elbow, for all the world as if they are lying on the couch with the remote in their hands watching "footie" on the television. Aside from the obviously dangerous creatures such as poisonous lizards and snakes, only the Tasmanian Devil and the dingoes are behind any kind of enclosure, since the Devil can bite and the dingoes are probably an escape risk; or perhaps would eat the other wildlife. The dingoes certainly were not in the least bit threatening - they are basically cute, perky, foxlike dogs, not particularly large or imposing, and were happy to eat some kibble out of my hand. Since the Devil is a nocturnal creature, I've never actually seen one awake. The closest to seeing one awake that I ever came was at the Sydney Zoo about 10 years ago when I saw one yawn, exhibiting an admittedly formidable set of teeth. However, overall the Devil is a small black beast with big pink ears and is not particularly scary-looking when it is sleeping! DH took a lot of great pictures on the trip so I thought I'd post some of them here. I'll post the pictures of the animals at the wildlife park in a separate post as I think there must be a limit to how many pictures will fit in one post and I have reached it! So, here I am again, back home. The flights from Adelaide to Melbourne and Melbourne to LA were fine but then I had a glitch in LA. Due to a big ice/snow storm on Sunday night in the Newark area, my plane from LA was delayed taking off as they had to wait for a different type of plane to fly in that could withstand the possibility of icing conditions on the descent into Newark. After a long wait - thankfully in the American Airlines Admiral's Club Lounge (one-day pass for $50) - I was finally able to head off on the plane from LA to Newark at 6:30 p.m. instead of 3:05 as scheduled. As a result, I got in at about 2:30 in the morning. Luckily I had ordered a limo to pick me up so my driver was ready and waiting. After collecting my bag, which I'd decided to check, we drove off for Bloomfield and I got home around 3:30 a.m. Baxter was very glad to see me and I finally went to bed around 4:30 - and slept until 2 the next afternoon! My plans to work at home on Tuesday didn't pan out as a result but I did go get Diva from the vet's. She was glad to be home and her scar has healed up nicely from her little operation, and the fur is growing back. That night I had trouble sleeping (jet lag can really do a job on you!) and the next day at work I was useless! Luckily Thursday I got my energy back and was able to work until 10:30 p.m. to nearly finish the presentation I had to make on Friday afternoon. It was a real team effort. The presentation wasn't really done Friday until about 12:45 p.m. - and the presentation was at 1 p.m.! I credit my experiences in the at-work Toastmasters Club that I belong to for pulling off a presentation without any practice! Of course, no stressful week would be complete without a dog-health-related crisis. Thursday night I arrived home at 10:45 p.m. from my late night at work (my friend was kind enough to go over at around 7 and feed and let out Diva). Naturally when I arrived Diva was put out that I'd neglected her all evening and was rambunctious. All I wanted to do was eat my frozen dinner, watch The Daily Show, and get a good night's sleep before my presentation. So I gave her a rawhide strip to occupy her for a few minutes. As soon as she finished it she came out looking for me and acting sick - licking her lips, etc. It apparently didn't agree with her. She wanted to go out and eat grass. Then she wasn't right all night long, which kept me up till about 1:30. I knew she didn't have anything life-threatening (she has had these incidents before and been rushed to the Emergency Clinic and she just had an upset stomach). But it certainly disturbed our sleep! She did get sick the next evening after eating more grass and now is recuperating nicely today on a diet of white rice, chicken and broth. No more rawhide strips for Diva - the pit bull with the sensitive stomach! DH came home last night on the same flight I came in on, but his was on time; in fact, it was early. Diva and I went to pick him up. As we were waiting for him to come out of the airport, surrounded by limos and other cars full of people waiting to pick up their friends and family, I noticed the car immediately behind us also had a woman with a dog waiting in it! So, things are back to normal now and spring is around the corner. All the snow and ice from Sunday melted in the past few days and today is a mild springlike day. Finally! If only it would last...Tuesday it's supposed to go back to being "unseasonably cold."